The Senate approved a bill, in a 38-27 vote, May 11 that takes one more step toward a constitutional amendment defining marriage as a union between one man and one woman in Minnesota. A similar bill in the House has not been yet come up for a vote, although it is expected to pass along party lines. 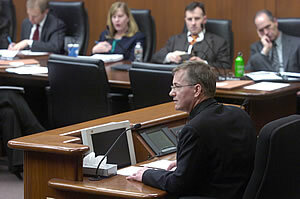 Two Minnesota Catholic bishops were among those who testified in House and Senate committee hearings in favor of bills that would put a constitutional amendment on the ballot in 2012 to define marriage as a union between one man and one woman. The church’s convictions about marriage “find ample support in principles which can be discovered by human reason and which have been reflected throughout human history,” Bishop Sirba said. The House bill, introduced by Rep. Steve Gottwalt (R-St. Cloud), was approved by the Civil Law Committee by a 10-7 vote. A companion bill in the Senate (SF 1308), authored by Sen. Warren Limmer (R-Maple Grove), was passed April 29 in the Senate Judiciary Committee, where Bishop John Quinn of Winona testified in support of the measure. “Defining marriage as simply a union of consenting parties will change the core meaning of marriage for every Minnesotan,” Bishop Quinn told lawmakers. “At best it is an untested social experiment. And, at worst, it poses a dangerous risk with potentially far-reaching consequences. “This could open the door to an ongoing process that redefines marriage according to the social needs of groups advocating change that, in time, could result in no fixed definition of marriage,” he added. The House bill could get a full floor vote by May 13. At the May 2 House hearing, Bishop Sirba was the third of seven people to testify on behalf of the House bill. Hundreds of people were directed to a lower-level room to watch the proceedings via live broadcast, as only ticketed participants were allowed into the packed hearing room. Testimony in support of the bill was also given by representatives from four other faith groups, University of St. Thomas School of Law professor Teresa Collett and Jennifer Roback Morse, founder and president of the Ruth Institute, a project of the National Organization for Marriage. Amendment opponents also testified. If the bill passes both houses, Gov. Mark Dayton can’t veto it because constitutional amendments placed on the ballot do not require the governor’s signature. To view the Minnesota Catholic Conference’s “Marriage Amendment Resource Page,” visit http://mncc.org/issues/marriage. For updates on the legislative proposal, visit mncc.org.